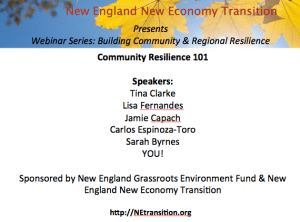 On Thursday, October 16, 2014 New England NET co-produced a webinar with the New England Grassroots Environment Fund (NEGEF) about “community resilience.” We discussed how we can all live well now and into the future, given the challenges of a hurting economy, climate change, resource shortages, and political paralysis. Across the nation, grassroots organizers are working to create resilient systems for food, energy, transit, health, livelihoods, education, and much more—systems that will be able to weather the coming shocks of a rapidly shifting economy and climate. In order to create resilience, people are coming together as communities, finding their inner passions, using their skills, and trusting each other. Truly resilient systems must be equitable, creating wellbeing for all across boundaries of race, class, language, and income. This work requires and enables us to reconnect with each other, repairing the torn social fabric we inherited. 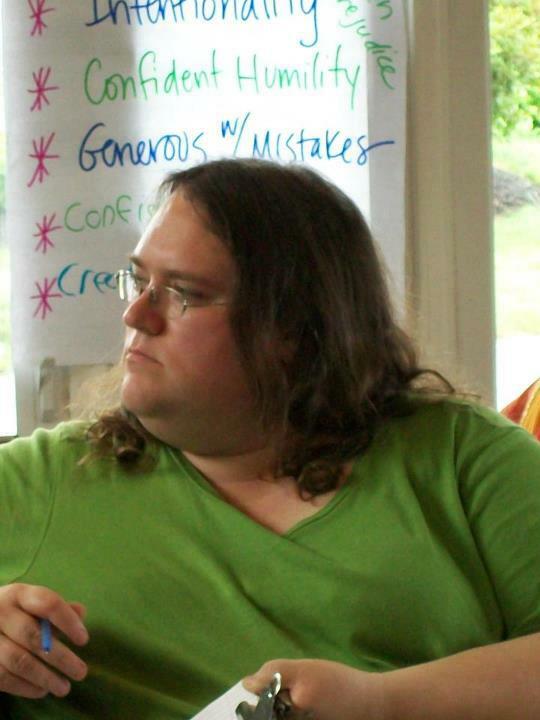 Since becoming a Certified Transition Trainer in 2008, Tina has worked with over 120 Transition communities, given 42 of the official Transition weekend courses in the U.S. and Canada, and provided hundreds of Transition presentations. Prior to doing Transition work full-time, Tina had been a trainer, program director and consultant for 25 years, supporting and guiding leaders in over 400 local, national, regional and local organizations. In Washington, D.C., she directed citizen training programs for 17 national faith communities, and she directed Greenpeace USA’s national citizen Activist Network. After moving to Massachusetts she directed the Veterans Education Project, the Western Mass Funding Resource Center, and a training program on personal financial management. 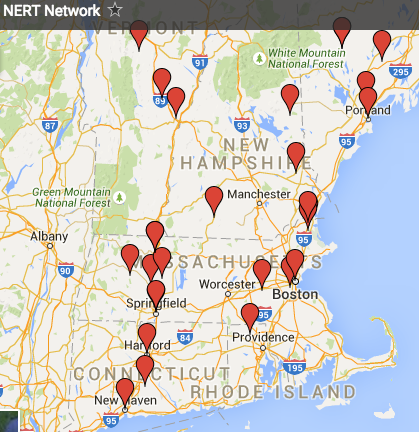 She founded and led campaigns on energy, environmental justice and toxins for New England Clean Water Action. 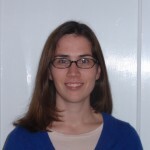 Most recently she was a consultant with 350.org, the Massachusetts Municipal Association, and the Sustainability Institute. Tina has an M.A. in Public Policy from the University of Chicago, a B.A. in Urban Studies from Macalester College, and is certified for mediation and consensus decision-making facilitation. Her passive solar, Platinum LEED, low-toxic, largely locally-built “Power House” won the Massachusetts utility company-sponsored competition, the Zero Energy Challenge, and the Northeast Sustainable Energy Association’s 2010 Zero Net Energy Award http://www.ZeroEnergyPowerHouse.com. Lisa Fernandes organizes the 1700+ member Portland Maine Permaculture group and is the Director of its non-profit home, The Resilience Hub. She is a trained facilitator and permaculture designer who believes that the strategies of resilience-building, re-skilling and re-localization are among the best we have for creating vibrant communities and for navigating future challenges. 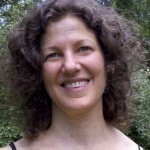 Lisa sits on the boards of the Eat Local Foods Coalition (ELFC), the Permaculture Institute of the Northeast and on the Grantmaking Committee of the New England Grassroots Environment Fund. 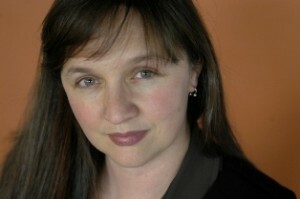 Lisa participates in the Portland Mayor’s Initiative for Healthy Sustainable Food Systems. She is also active in the Cape Farm Alliance, Slow Food Portland, Portland Food Coop, Hour Exchange Portland and is a Master Food Preserver and Master Composter. 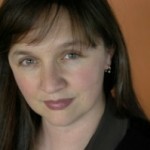 Lisa attended Boston College and The Evergreen State College and has worked in the public, private and non-profit sectors, including a stint owning a software design firm with more than 100 client companies across the region. Lisa and her family are actively converting their 1/3 acre property into a demonstration site for resilient and abundant “post-carbon” living. 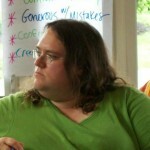 Jamie Capach is the Secretary and Assistant Web Editor of Transition Keene Advocates. 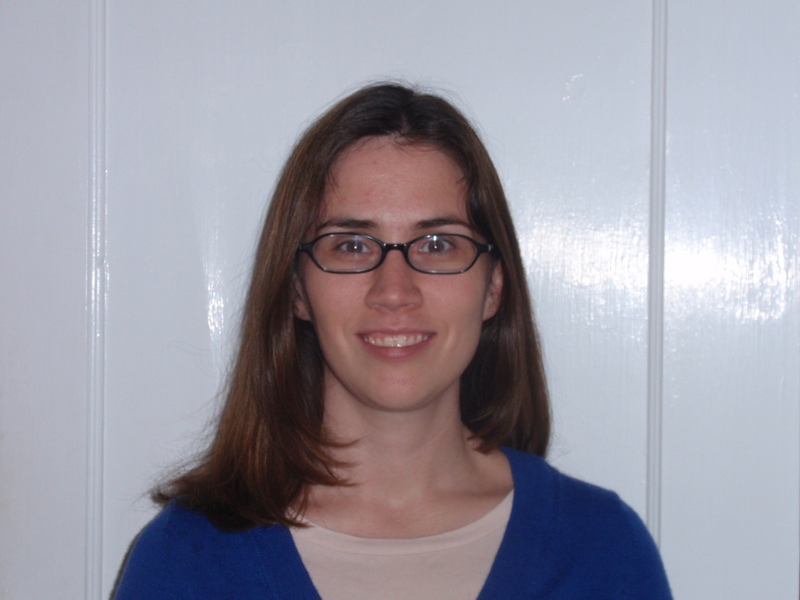 She worked for seven years in community access media before moving to Keene, NH to study Advocacy for Social Justice and Sustainability at Antioch University New England. Her professional and volunteer activism has included marriage equality, transgender liberation, shutting down Vermont Yankee Nuclear Power Plant, organizing community forums on affordable healthcare, and repealing the death penalty in New Hampshire. For the past three years, Jamie and her family have lived without an automobile and have relied on public transportation, bicycles, ridesharing, and the Monadnock Time Exchange to get where they need to go. 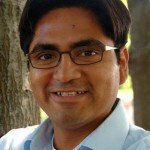 Carlos Espinoza-Toro is the Director of Community Organizing of the Jamaica Plain New Economy Transition. He provides critical support to the implementation of transition initiatives through engaging with diverse groups, building trust, and addressing the tensions between systemic thinking and on-the-ground development. Before joining IPS, Carlos worked as a Program Manager at the MIT Community Innovators Lab bringing together volunteers, community members, government officials, nonprofit directors, and academics to develop and implement neighborhood development programs to improve the lives of disadvantaged communities. Carlos holds a Masters in City Planning from the Department of Urban Studies and Planning at the Massachusetts Institute of Technology.